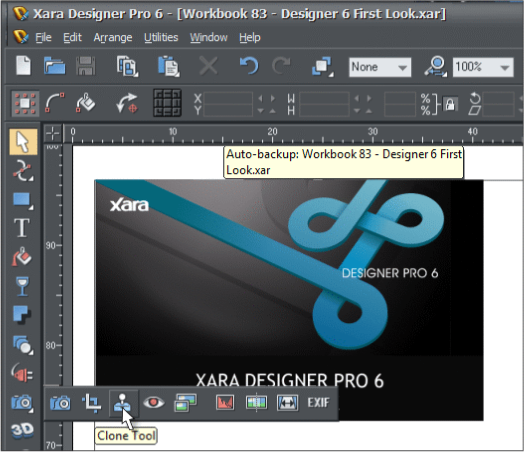 Note: Xara Xtreme has been renamed Xara Photo & Graphic Designer 6 and Xara Xtreme Pro has become Xara Designer Pro 6. In this preview of V6 by Gary Priester, first published on The Xara Xone, Gary focuses on Pro 6, but Photo & Graphic Designer 6 shares all the new features described here, except for the Web features. Introduction In this Special Edition Tutorial, we will look at the long awaited release of Xara Designer Pro 6. Yes, that’s right. We are talking about the next version of Xara Xtreme Pro which has been renamed, Xara Designer Pro 6. Xara Designer Pro 6 has all the great web design tools that were introduced in Web Designer 6 (see WD 6 features here), plus all of the great drawing and photo editing tools found in Xara Xtreme. In this First Look, we will focus on the Pro version. For a comparison of features between the two versions, visit Xara.com. If you are currently using Web Designer 6, the new high tech, high touch user interface will already be familiar. But in case you have not seen the new interface, which your editor really loves, you can see an example in the screen capture above. Most of the familiar tools are still there, and even though the buttons have been simplified, you will still recognize them. But some tools and features are now contained in fly out menus, which we will look at in a moment. Yes, that is a Clone Tool!!! We will cover that shortly. Also shown in the screen capture above is a feature anyone who has ever lost work will appreciate: Auto-Backup. This feature, which can be configured in Page Options, makes a back-up copy of your document every 10 minutes, or at intervals you specify. Xara makes a series of ten most recent back-ups, which you can edit in Page Options > Back-ups. One more really cool new feature. If you just close your document by clicking the red X close button at the top of the screen, Xara Designer Pro 6 opens that file(s) the next time you open the program. Excellent! Here are some of the new fly out menus and what is contained in each. At the top of the page is a New Page fly out. The options are duplicate page, new blank page and delete current page. The Arrange fly out menu has options to bring a selection forward, backward, forward one, back one, group and ungroup. The Zoom fly out has all the Zoom options. The Edit fly out has various edit options including Paste in Place, Paste Attributes, Paste Opacity Mask (covered soon) and Paste into Current Layer. There are two new website related options: Export and Preview Current Page and Export and Preview Entire Website. At the right side of the Website Properties fly out is a new feature that you will really love, Create Navigation Bar. 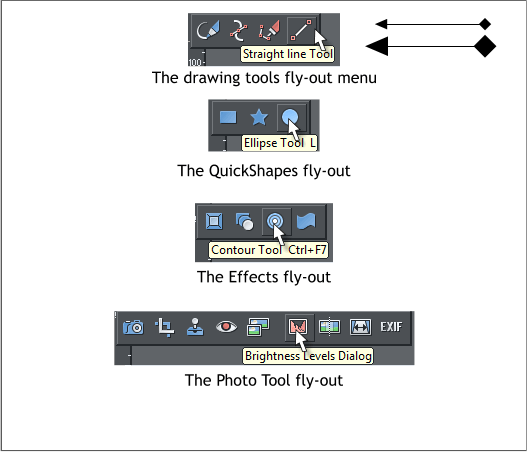 Many of the tools have also been logically grouped into fly out menus. The Drawing Tools fly out contains the Freehand and Brush, Shape Editor and Pen tools. Plus a new addition, the Straight Line Tool which as you may have guessed, draws straight lines. It can also draw arrows which you can scale, interactively. This is way cool! The QuickShapes fly out contains the Rectangle, Ellipse and QuickShape tools. It is all so neat and logical. The Effects fly out contains the Bevel, Blend, Contour and Mould tools. The Photo Tool fly out is jam packed with new features which we’ll look at in a moment or two. 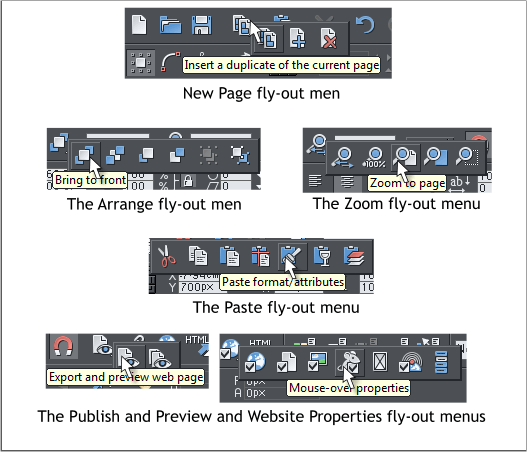 The Zoom Tool flyout is a duplication of the Zoom fly out on the Infobar except it also includes the Push Tool.